【植物, 植物学】 ブルーベリー 《スノキ属の低木; 果樹として栽培される》. (countable) An edible round berry, belonging to the cowberry group (Vaccinium sect. Cyanococcus), with flared crowns at the end, that turns blue on ripening. (countable) The shrub of the above-mentioned berry. (countable and uncountable) A dark blue colour. Of a dark blue colour. To gather or forage for blueberries. We blueberried on an open flat beside the river. The ground was covered with great frosted blue globules, sweet and warm in the sunshine. They had not passed again in the surrey going to the Forks, nine miles away, and none of the girls had been blueberrying among the bushes at the edge of the woods. Sarah and I have been blueberrying together off and on since the summer of '64. This morning, armed with our pots and pans, we went out and picked two quarts of wild berries and then came home and made a cake. Pointy fraise de bois went through it all with undiminished generosity (so small a plant for all that giving!) and the picking was fine, for the birds were off blueberrying and taking the late raspberries just as they ripened. On some of the richest days, when a moose stalks by or a bear is blueberrying or munching hazelnuts outside, I think of my house as a bathysphere suspended in the wilderness. "Come, Aunt Flo. I'll show you where we go blueberrying. Last year we got almost a bushel of berries, and Papa says they should be ripe now." We decided to go blueberrying one day up in our hills. We grabbed our blueberry cans, hitched them to our belts, and headed for the blueberries. Vaccinium sect. Cyanococcus on Wikispecies. Blueberries are flowering plants of the genus Vaccinium (a genus which also includes cranberries and bilberries) with dark-blue berries and is a perennial. Species in the section Cyanococcus are the most common fruits sold as "blueberries" and are mainly native to North America. They are usually erect but sometimes prostrate shrubs varying in size from 10 centimeters (3.9 in) to 4 meters (160 in) tall. 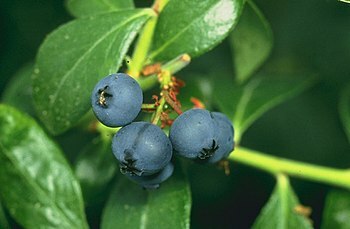 In commercial blueberry production, smaller species are known as "lowbush blueberries" (synonymous with "wild"), and the larger species are known as "highbush blueberries". The leaves can be either deciduous or evergreen, ovate to lanceolate, and 1–8 cm (0.39–3.1 in) long and 0.5–3.5 cm (0.20–1.4 in) broad. The flowers are bell-shaped, white, pale pink or red, sometimes tinged greenish. The fruit is a berry 5–16 millimeters (0.20–0.63 in) diameter with a flared crown at the end; they are pale greenish at first, then reddish-purple, and finally dark blue when ripe. They have a sweet taste when mature, with variable acidity. Blueberry bushes typically bear fruit in the middle of the growing season: fruiting times are affected by local conditions such as altitude and latitude, so the height of the crop can vary from May to August depending upon these conditions.